Scott Eyman has been crafting definitive Hollywood biographies for over 20 years now, and each one seems to come hotter on the heels of the one before. His Lion of Hollywood: The Life and Legend of Louis B. Mayer and Empire of Dreams: The Epic Life of Cecil B. DeMille appeared only five years apart (2005 and 2010 respectively); a lesser writer — someone like, well, me for instance — might have spent 12 or 15 years on either one of them and never managed to convey the sense that yes, this must be what the man was like, as well as Scott did both times. And as if that weren’t impressive enough, in between those two he collaborated with Robert Wagner on his 2008 autobiography Pieces of My Heart. Scott’s latest book is John Wayne: The Life and Legend — and yes, this must be what the man was like. This is very much a companion volume to Scott’s 1999 bio Print the Legend: The Life and Times of John Ford, and it could hardly be otherwise: the two names were linked in life and art as few others have been. Both books end with the final image from The Searchers: Wayne as Ethan Edwards, framed in the cabin door and walking away from the family reunion into a barren landscape. Perhaps the biggest surprise for me was how separately the man viewed himself from “John Wayne”. “In Wayne’s own mind,” Scott writes, “He was Duke Morrison. 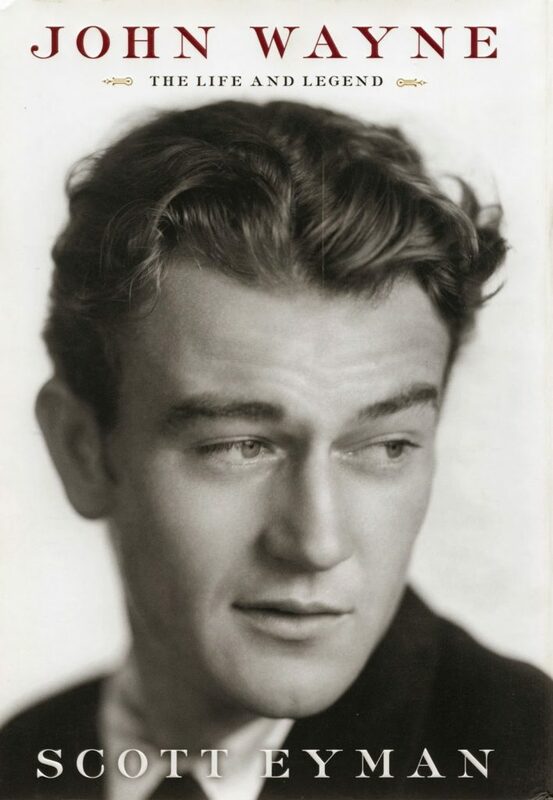 John Wayne was to him what the Tramp was to Charlie Chaplin — a character that overlapped his own personality, but not to the point of subsuming it.” The Duke never legally changed his name; his death certificate identified him as “Marion Morrison (John Wayne)”. Scott gives us a picture of Wayne the underrated actor (how anyone could watch Wayne’s performances in Stagecoach, They Were Expendable, The Searchers, True Grit, Island in the Sky, She Wore a Yellow Ribbon and The Quiet Man and still say he was “always the same” strikes me as a study in obtuseness, and I suspect Scott would feel the same way). The biography doesn’t shrink from an honest appraisal of the conservative politics that made Wayne such a hated lightning rod in the last third of his life, or the fact that he could be impatient, demanding, gregarious and charming — sometimes by turns, sometimes all at once. We also see the history buff who knew the American Civil War backward and forward, the collector who could discuss Asian or Native American art, and the “demon chess player” who could psych out an opponent as much as out-maneuver him on the board. That, I think, is the John Wayne I would like to have met. And thanks to Scott Eyman, I feel like I have. Love all of Scott Eyman's books – his Lubitsch biography is beyond great – and since Wayne is one of my all-time favorite actors, I'm chomping at the bit to get it…just as soon as that income tax refund check shows up.